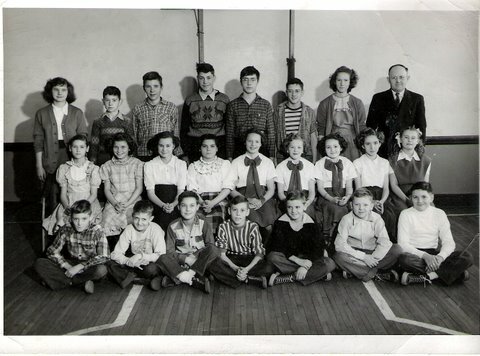 I started first grade at the Goshen School and spent 8 years there. When I started, the “outhouses” were at the end of the driveway behind the school, next to the Leggett property. I remember inside plumbing coming to Goshen but I don’t remember what year. If you went in the left hand set of doors if you were facing the school, at the bottom of the basement steps on the left was the electrical panel and that is where the janitor had a switch to ring the bell for all events. In that same little area was the old hand pump for water. When the restrooms were installed, we also got an electric pump and water fountains. Up town! We even had a shower in the restrooms. Originally as I recall there was a stage in the gym on the top floor on the left side facing the front of the school from the 416 side. I remember Hupp Music Store putting on a show there with a goup of students playing “Hawaiian Guiltars.” I think Harold Lute played in that performance. Last I heard Harold was still Mayor of Roswell. (He recently resigned that position after many years.) Also, our school plays were performed there. Later the stage came out and we used the gym. During my 7th and 8th grades, the stage end of the gym was turned into a classroom. Mr. Bowers was the principal and taught 7th and 8th grade. 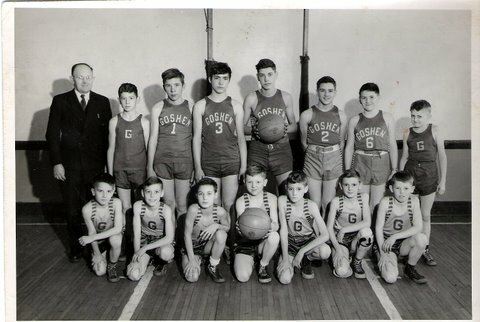 When I first started school at Goshen, Stoggie Rausch was the janitor. Later on Mr. Brennan became the janitor. The only two cooks I remember were Silvia Johnson and Mrs. Hibbs. Basketball coaches I remember were Bill Anderson and Woody Richardson, who was also our mail carrier. Woody’s sons Billy and Eddie attended school there. We had trouble with the milk vanishing from the cooler in the basement at one time. There were a group of rascals that figured out if you removed the coal cover on the coal cellar (in the back of the school) and slipped in you could enjoy a free milk. Don’t think the school ever figured it out but they did lock the cooler. We used to always sit on the steps in front of the school and each of us would pick a brand of car and we would count how many went by. We were easily entertained. At lunch during the summer there was always a softball game. Mr. Bowers would pitch for both sides and of course, he pitched according to the hitter’s ability. In the winter it was basketball. Mr. Bowers bought one of the early ’55 Chevy V8’s and took a group of us for a ride at lunch time down to Helen Rolli’s tavern and back. V8Chevy was hot in those days! Each year at the end of basketball season, Mr. Bowers would put on a dinner for the school. We did pray before those meals and we did say the pledge each morning before class. I don’t remember anyone being seriously injured as a result. I remember when Lucille Reynolds got Polio and we all got our sugar cube. I remember once when the flag rope broke, Mr. Bowers had Harold Lute climb the flag pole and put a new rope through the pulley at the top. Today they would probably sue you for even thinking such a thought. Growing up in Goshen was a great life with great people. Bob says that he and Russ Hobart were “terrors” during Halloween when they were young. ” I think Tom Brokaw liked to chase us as much as we enjoyed soaping his windows,” Bob said. He also told of the time he and Russ were “picking on” Waldon Leggett.